Inspired by our Book­storm fea­ture this month, Let Your Voice Be Heard: The Life and Times of Pete Seeger, there was a pot of stew bub­bling in many a hobo camp dur­ing the Great Depres­sion and many a hoo­te­nan­ny in the ’50s and 60s’. This quick-to-assem­ble ver­sion can stay in your slow cook­er until you’re ready to eat. Cut beef into 1.5” cubes. Place them in the slow cook­er and mix in Kitchen Bou­quet. Add beer, onion soup mix, brown gravy mix, and Worces­ter­shire sauce. Set pot to 200 degrees (low) and let cook for 8 to 10 hours. 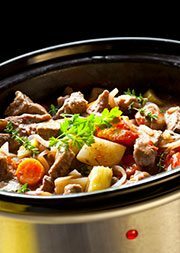 Stir in mush­room soup and veg­eta­bles and cook an addi­tion­al 30 to 40 min­utes. Makes about 8 serv­ings.